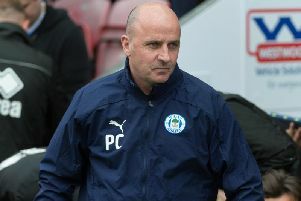 Paul Cook was in danger of running out of superlatives in assessing the contribution of Gary Roberts during Wigan Athletic’s 1-0 victory over West Brom. Roberts, one of four changes to the Latics starting line-up, was outstanding throughout, and thoroughly deserved the standing ovation which followed his 90th-minute substitution. The 34-year-old had played only seven minutes of league action this term prior to Saturday, but Cook saluted his professionalism in making sure he was there when his team needed him. “Gary was absolutely magnificent, he carries such magnificent fitness levels,” enthused the Latics boss. “You’d never know he hadn’t started a game this season, or he’d been injured for a full week leading into the game. “He only resumed training on Thursday before the game, but he will sleep until Monday probably! “He kept looking up at me going: ‘Get me off’ but that’s football - and that’s Gary. “You can’t have enough of people like that around the club...last year we had Noel Hunt, Dave Perkins, Alex Bruce, who’s still here. “It’s important for the whole club we have people like them around this football club. Cook had been forced into a major reshuffle pre-game, in the absence of Will Grigg, Michael Jacobs (injury), Antonee Robinson (fatigue) and Darron Gibson (suspension). But the ‘patched-up’ side responded with one of the best performances of the campaign. “We’ve got a very good squad, and we know we’re in a very good division,” Cook acknowledged.